Jackie Scott outside the Federal Court in Vancouver on Monday, July 22, 2013. Photo by the Canadian Press, Daryl Dyck. Jackie Scott has no doubt that she is Canadian. It’s in her blood, and in the way she was raised. Her father was a Canadian soldier who served overseas during the Second World War. He met a British woman. The couple fell in love and had a child. A few years later, the family moved to Canada, where Ms. Scott’s parents then married. Because she was born abroad and out of wedlock many years ago, when a stigma was attached to the circumstance, Ms. Scott is still refused Canadian citizenship. This despite the fact she spent her childhood in Ontario, and now lives in British Columbia. Her own daughter is a Canadian citizen. And she’s not alone. 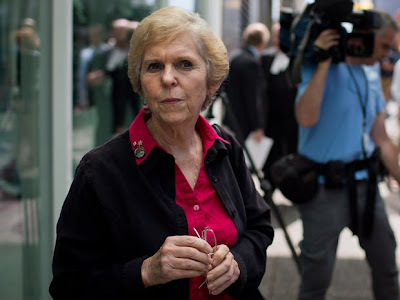 Ms. Scott is one of perhaps thousands of so-called Lost Canadians, men and women who for nonsensical reasons continue to be denied citizenship by the federal government and by citizenship courts. Some Lost Canadians may not even realize their predicament; Ms. Scott didn’t know she lacked citizenship until 2005, when she requested an official certificate and was turned down. She suspects that a promise to remedy her situation — made a year ago by Jason Kenney, then Minister of Citizenship, Immigration and Multiculturalism — will not be kept, and she is therefore seeking redress in the courts. On Monday, Ms. Scott appeared with lawyers before a Federal Court judge in Vancouver, and applied for a judicial review of her case. Although the matter was adjourned to August, Ms. Scott’s legal counsel advised the court that she may choose to litigate the case as well, perhaps bringing others on board with a class-action lawsuit. Don Chapman was in the courtroom, listening intently. A former airline pilot, he spent the past decade raising awareness about the Lost Canadians, most of whom were actually born in this country but denied citizenship for one arcane reason or another. Mr. Chapman is one of thousands whose citizenship was finally affirmed four years ago, when parliament passed Bill C-37, legislation that solved previous legal conundrums. Unfortunately, C-37 didn’t help war babies such as Ms. Scott, born out of wedlock and abroad prior to 1947, and it didn’t help children born in wedlock to Canadian women and foreign nationals, including Americans.